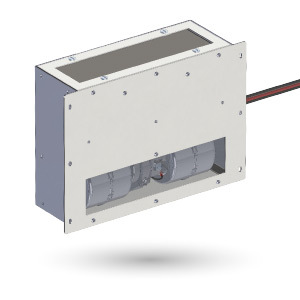 Developed to clear windscreens quickly and efficiently, generating 750W/1.25kw of heat. The all new Grayson Electric Demister & Cab Heater series began production in July 2016. Developed to clear windscreens quickly and efficiently, generating 750W/1.25kw of heat. The fully electric heat supply helps to reduce CO2 emissions from your vehicle while directing heated air through a 2 speed brushless blower. The internal electronics controller allows the heater element to run for 30 minutes at a time. The Grayson Electric Demister & Cab Heaters is durable with a filter to prevent debris falling into the unit, as well as an air filter to prevent dust build up on heater elements, ensuring your demister is always working at peak performance.